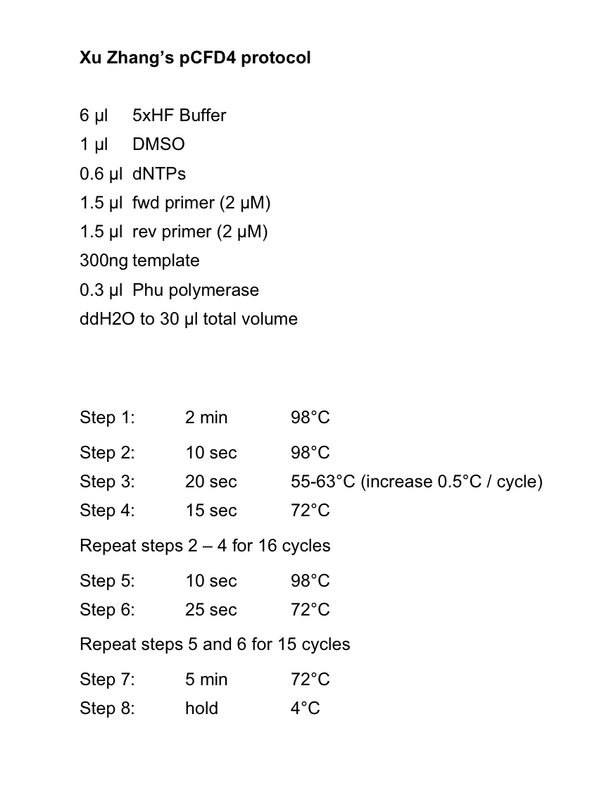 Xu Zhang from Frank Schnorrer’s lab in Munich has send me a kind email sharing his PCR protocol for pCFD4 cloning. This PCR, which introduces both guide sequences into this double gRNA vector, is prone to give background bands. I had several users write to me saying that they, sometimes exclusively, get a smaller band than the desired 600 bp product. This was usually solved by adjusting the annealing temperature, but a small amount of background often remained. Xu had the same issues and has now optimised the PCR conditions such that it yields only the desired product. He is using Phusion high fidelity polymerase.